Colorado National Monument is named after the river rather than the state, and covers a relatively small area of eroded red rock formations and canyons just south of the Colorado near Grand Junction. This large city, near the Utah border, is surrounded in most directions by impressive multi-colored rocks; the orange/brown layered Book Cliffs dominate the town from the north, and extend westwards for nearly 200 miles to the Manti-la-Sal mountains of central Utah. 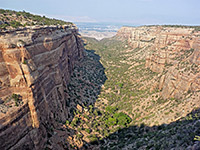 Immediately southwest of town, tributaries of the Colorado river have carved through the edge of the high Uncompahgre Plateau that borders the Colorado for some distance, and the most scenic area, about 10 by 5 miles, is contained within the national monument. This contains four main canyons, cutting into the plateau for several miles, with several smaller ravines, isolated towers and pinnacles, and many other sandstone formations. The national monument is pleasantly scenic, not one of the major attractions of the Southwest, but well worth visiting for at least a few hours. The cliffs are made of Entrada/Wingate/Kayenta sandstone layers in various shades of red and white and so the canyons are similar to others in nearby states, especially Canyon de Chelly in Arizona and parts of Canyonlands in Utah. The establishment of the national monument in 1911 was largely due several years of campaigning by one man, John Otto, who explored the canyons and single-handedly built many miles of trails through the area. There is one paved road through Colorado National Monument, beginning south of Grand Junction - just 4 miles from the town center, this flat city street (Broadway, later Monument Road) crosses the Colorado River, passes the entrance gate and becomes steep and twisting, round many 15 mph corners and through one tunnel, as it ascends the towering red cliffs. 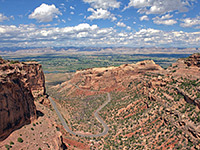 The road (now the Rim Rock Drive) then follows the edge of the Uncompahgre Plateau for 20 miles, giving access to 16 major viewpoints and seven trailheads. Towards the north end it passes the main visitor center and camping area, before winding down equally steeply, through two more tunnels, and eventually re-crossing the Colorado River into Fruita. The four main canyons become more spectacular northwards. The southernmost is No Thoroughfare Canyon, which is not generally visible from the road and is only reached by a long foot trail, or unpaved tracks. Next is Red Canyon; this is shorter, and has the suburbs of Grand Junction visible at the far end, but there are no trails down the steep cliffs. 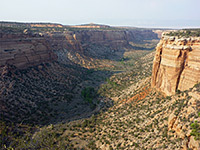 Ute Canyon is rather longer and deeper although it has a similar appearance, bordered by vertical cliff walls of banded, colored strata contrasting with the green vegetation along the streamway. There are several good overlooks including one with a view of Fallen Rock, a huge slab from the cliff wall that has slumped sideways while remaining upright, still with bushes growing on top. North of Ute Canyon, the next few miles of the road move to higher ground, away from the red rock ravines, passing one named overlook (Highland View) then descending towards Monument Canyon. Monument is the longest of the four main ravines, and contains most of the major rock formations. Clearly visible from the road are the Coke Ovens, where the end of a ridge has eroded into a series of large cream-colored mounds; there is a short path along the ridge, and a much longer trail down and along the canyon. This is 6 miles long and is steep at first as it descends to the floor of a side ravine, following the course of a seasonal stream and passing underneath the Coke Ovens before becoming more level. It joins the main canyon after about 2 miles, when some of the large named rock formations become visible. 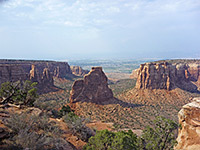 Further along the road, Monument Canyon View offers another panoramic vista. After several lesser viewpoints, the Rim Rock Drive passes through Half Tunnel where for many meters the road is cut into the face of a sheer cliff, and constituted a major feat of engineering when the rim drive was built (in the 1930s), but one that resulted in the death of 11 workers when part of the roof collapsed. A plaque records this accident further along the road, near Grand View - this viewpoint has great vistas along Monument Canyon, the adjacent Wedding Canyon, and beyond across the wide flat Grand Valley of the Colorado. 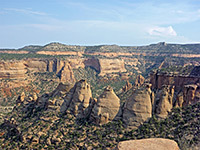 Dominating the foreground is Independence Monument, an isolated 450 foot tower of sandstone at the junction of the two canyons; this is visible from many places including a named viewpoint along the highway. There are various other rock formations and viewpoints near the visitor center, at the north end of the national monument, before the road drops down steeply, back towards the Colorado River. Near Independence Monument View, the half mile Otto's Trail follows a gently sloping ridge to another good vantage point beside a tall, conical formation known as the Pipe Organ. The similarly short Window Rock Trail also leads to an overlook at the plateau edge, next to an angular natural arch. This path starts along the one-way campground loop, and is linked to the main road by the Canyon Rim Trail, along the edge of Wedding Canyon. Beyond here, the northernmost section of Rim Rock Drive descends via switchbacks and tunnels, past another six named viewpoints, mostly of distant lands to the north. 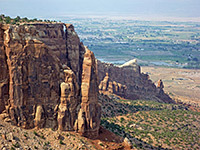 The Uncompahgre Plateau continues for many miles south and west of the Colorado River. There are plenty of rough tracks through this region, but one of the main points of interest, Rattlesnake Canyon, is only reached by a long foot trail, which in turn is accessed by Black Ridge Road, forking west half way along Rim Rock Drive. This remote canyon is about 6 miles from Colorado National Monument and contains the second largest group of sandstone arches in the world, after Arches National Park in Utah. 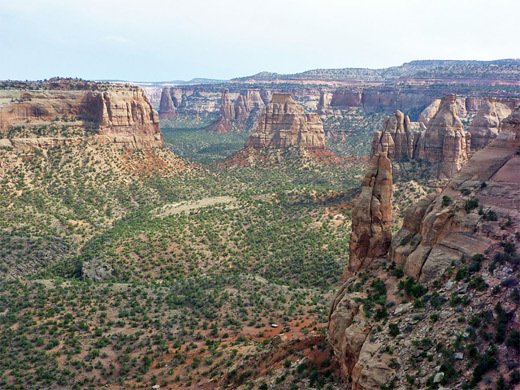 The nearest towns with hotels close to Colorado National Monument are (distances from the visitor center) Fruita (7 miles), Grand Junction (18 miles) and Clifton (22 miles).